The Galway Girls, who developed as a spinoff of Frank McCourt’s The Irish…, will appear at the Pierre Hotel in Manhattan on St. Patty’s Day Saturday, March 17. 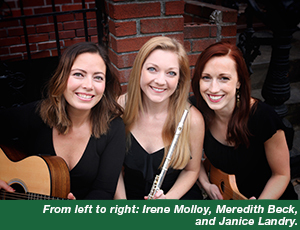 The three girls are part of the Bucks County Center for the Performing Arts – Meredith Beck, Irene Molloy, both born and raised in Bucks County, and Janice Landry of Boston. There is a $70 cover charge and $25 food and beverage, minimum. Advance reservations are required. For bookings, call 212-940-8113 or email twoe@tajhotels.com.